Yesterday’s hike was wonderful but too long, and the bus rides back required too much sitting out in the chilly ocean wind. So this morning, just like Jane Bennet and several dozen other 19th century characters who get caught out in uncomfortable weather, I “fell ill.” Not too ill, fortunately — no three weeks bed rest or anything like that — just a truly annoying head cold and earache. A quieter day was in order. The museum was still closed. I worked from a cafe for most of the morning and eventually adjourned to Max Gate, the house of Hardy’s prosperous years that he designed himself. It’s about a mile outside of town. The house itself is unusually appealing, with spacious rooms and a sensible layout (Hardy began his career as an architect). More exciting than the house, though, were the gardens out back, which are planted to resemble the gardens that Hardy himself planned and laid out — well, his servants did the heavy lifting. More exciting than THOSE gardens, though, were the plots in the massive community garden that I noticed just across the street when leaving Max Gate. Naturally I wandered in, had a nice conversation about cucumbers with an older woman who was growing many varieties of beans, and generally ogled. Lots of lettuces, peas, carrots, potatoes, beets, and a few summer squashes, but none of the hot weather crops that are taking off right now in Virginia. Apparently you need a greenhouse for tomatoes, cukes, and peppers in this country. Meanwhile, I adore the ubiquitous English solution to trellising runner beans: tying together long bamboo poles in the shape of a very narrow tent. The plants look great twining up it. A funny thing about England — the UK in general, really — is the way agricultural activity seeps into the lives of people who aren’t farmers. That’s partly because the nation is laced with a magnificent network of walking paths, many of which cut right through farmers’ fields. 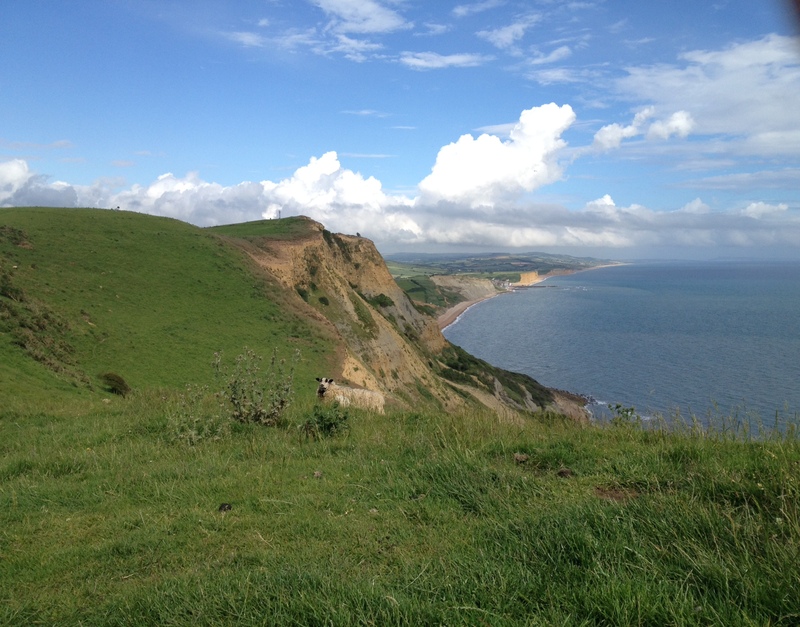 So today, when the museum was closed and I decided to walk a 7-mile stretch of the South West Coastal Path, along the top of glorious cliffs, descending to sea level and climbing up several hundred feet a dozen times, discovering that a detour would add two miles to the hike, and realizing I had probably bitten off a bit too much, I was often accompanied by highly incurious ruminants who were biting off as much grass as they could. Sometimes sheep and their fat little lambs, whose tails wag ecstatically when they go in for a nurse; sometimes big bored cows. They all keep the path nice and mown for walkers, so little human maintenance is required. Looks healthy now, but he’s got internal injuries. Yesterday, I performed surgery. It was on a zucchini plant. The plant is probably dead. I removed its worm. Caterpillar, actually. One of the most pernicious pests of cucurbits is the vine borer, a huge and hideous black/red bug that looks more like a wasp than the moth that it is. The adult lays eggs on plants’ stems; when they hatch, they “bore” into the tender vine and eat their way along its length. By the time the caterpillar is crawling, it’s usually too late to save the plant, which is quickly cut off from its water supply. 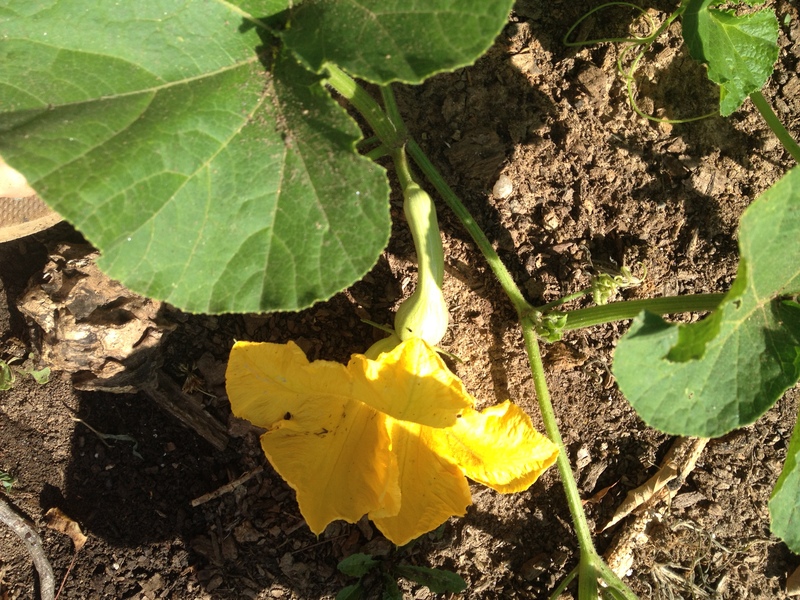 So when I saw adult borers circling my squashes, I started checking every day for their itty bitty red eggs. But I missed one — at least one. 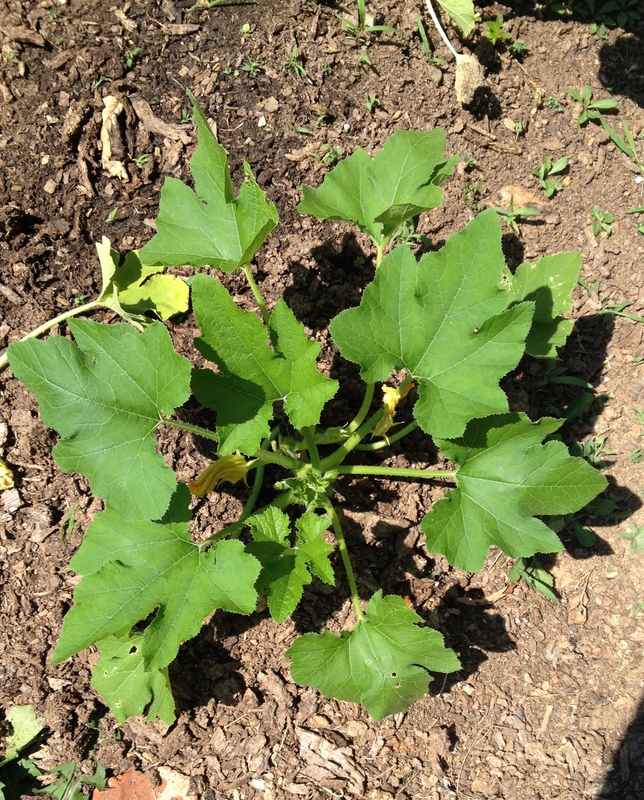 Yesterday, I saw the telltale frass — caterpillar poop — sprayed out around a zucchini stem like sawdust. So I did what the internet told me to do: grabbed a sharp knife, cut vertically along the stem, and found the squirmy baby jackass cozied up inside. Then I stabbed it to death. Vegans who think avoiding meat equals shunning violence: Ha! I’ve killed more bugs in the past three months as a vegetable gardener than I killed in my first 21 years, when I ate meat and couldn’t tell a pepper plant from basil. Don’t even get me started on the deer and rabbits that my farmer friends slaughter to protect their lettuce and carrots. Anyway. Off to England. I don’t expect the zucchini to survive my absence, but I heaped a generous mound of compost on his wounded stem just in case. Tomorrow I’m leaving on a research trip to England, so the goal for tonight’s dinner was to use up everything in the fridge. And everything that was ready in the garden. Collard greens and escarole, pulled to make room for more eggplant, went into a brothy, garlicky parmesan soup. Tofu and (leftover, canned) tomatoes were combined into something sweet that reminded me of Vietnam. Diced beets and new potatoes, tossed with dill, made some sort of salad. 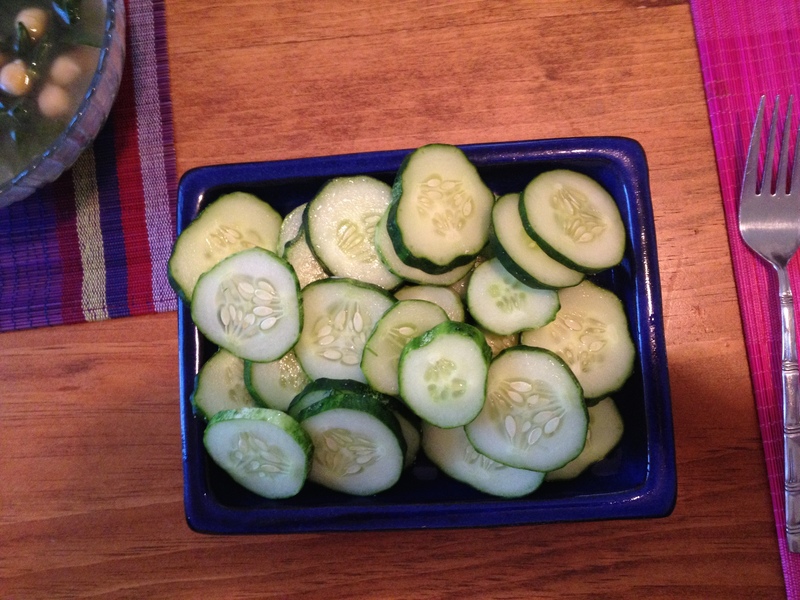 My boyfriend liked the tofu dish best, but the guest of honor — my friend Carol, who will be babysitting the garden this week — was most excited about the tray of plain cucumbers that I had snipped earlier in the afternoon. Yup, they are ready. Every time I go away this summer, I get actually sad about missing phases in my garden’s development. Novice obsessiveness. But then it’s also incredible to come back and discover how much everything has grown in just a week or whatever it is — squash vines creeping practically into the next lot, eggplants in bloom, tomatoes gone wild. The hanging plant that my parents got for my front porch when they visited in April is almost dead. My vegetable garden, on the other hand, is doing great so far. It’s so much easier to care about things that are going to feed you than about things that just look nice. For me, at least. Flower gardeners surely feel differently. Maybe most people do. But I’m the type of woman who will spend an hour cooking a meal and many hours raising a garden or knitting a sweater but won’t spend more than 30 seconds dealing with her hair. Or makeup. Or outfit. A real 20-something frump, in other words. But even my tribe appreciates beauty, both of the practical nature (squash vines look so wonderfully strong) and of the purely aesthetic variety. My Early Mohawk Beans bloomed today. The flowers are delicate, shell-shaped, and lightly tinged with lavender. I spent enough time admiring them that my neighbor, who is often out on her porch smoking a cigarette, must have questioned my sanity. Superlative blossoms. But I won’t replant the variety if the beans don’t taste just as good. Swiss chard is the star today, but you can see some tomatoes and eggplants awaiting their turn in the wings. We got a lot of rain last night and this morning the air blissfully cool. Perfect greens-picking conditions. 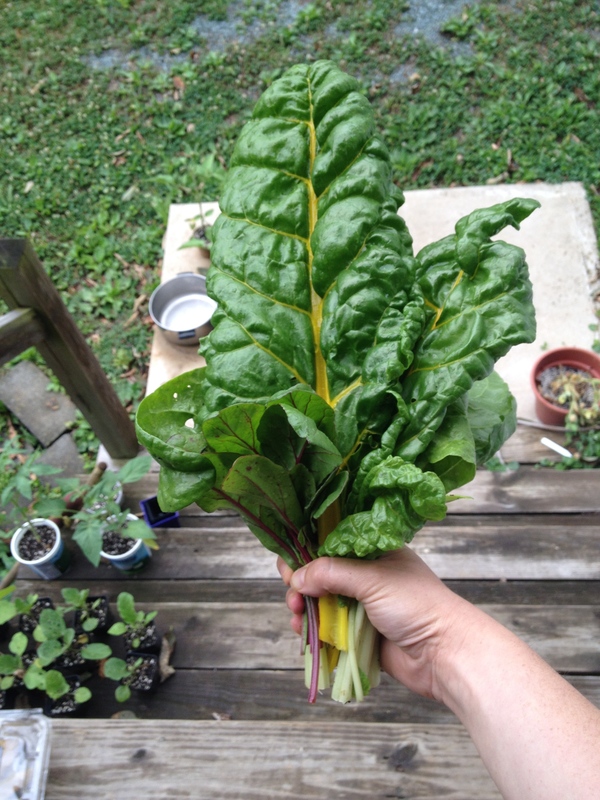 So I pulled up most of the lettuce and all of the Swiss chard for tonight’s dinner. The sky is pretty gray–a relief after last week’s blasting sun–so this evening I’ll finish demolishing nearly three months’ work (the plants’, and mine) and transplant my remaining nightshades, which have been trapped in their containers so long that they’re starting to look like adolescents who have outgrown their clothes. On Wednesday I’m leaving the country for a week and a half, and I’d like to see them cozily settled into their adult soil before then. Hurts me more than you, little lettuce. I thought the point of gardening was to grow great, healthy food, to pay a few cents less for it than you would at a farmer’s market or grocery store, to excuse yourself from supporting that latter institution and its associated environmental horrors. And sure, the food is great. I did (in the end!) harvest my first cucumbers yesterday, and they were the sweetest, crunchiest cucumbers I’d ever tasted. But I didn’t count on the growing emotional attachment to my plants. I kind of love them. I talk to them while weeding and watering; I monitor their growth; I try to give them every nutrient they might need. So it’s hard to kill them. 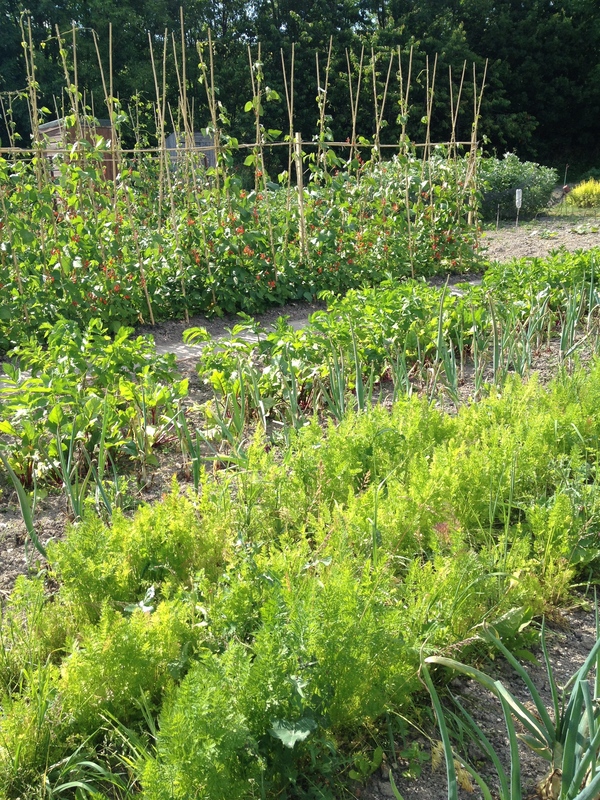 My spring bed contains a row of English peas, swiss chard, and a whole lot of lettuces. All of it has to come up this weekend to make room for tomato and eggplant starts, which I’ve raised from seed. 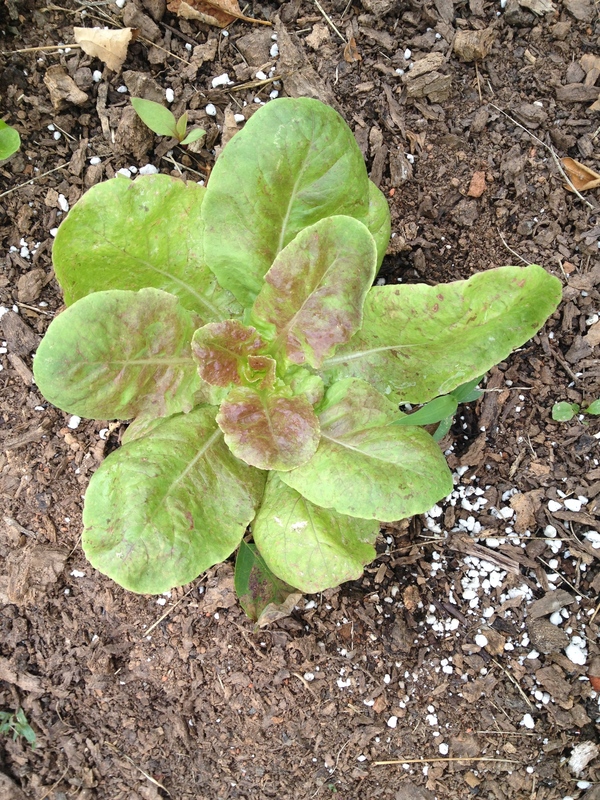 It’s time: the lettuces will soon bolt and turn bitter in this southern heat, and the peas have really slowed down. But they are still producing a few new pods! And the lettuces are so perfectly pretty! Ripping them out of the ground will feel like an awful betrayal. I’ll eat them anyway. Patience is hard, especially when it involves delaying gratification. I get anxious whenever someone brings up that famous experiment–the one where kids can choose between one marshmallow now or two later, and the kids who choose the first option end up failing at life–because I’m pretty sure that as a kid I would have taken that immediate marshmallow. Now, as an adult, I spend a lot of time reminding myself that adults delay gratification. In the garden, though, delay can cause as many problems as impatience. 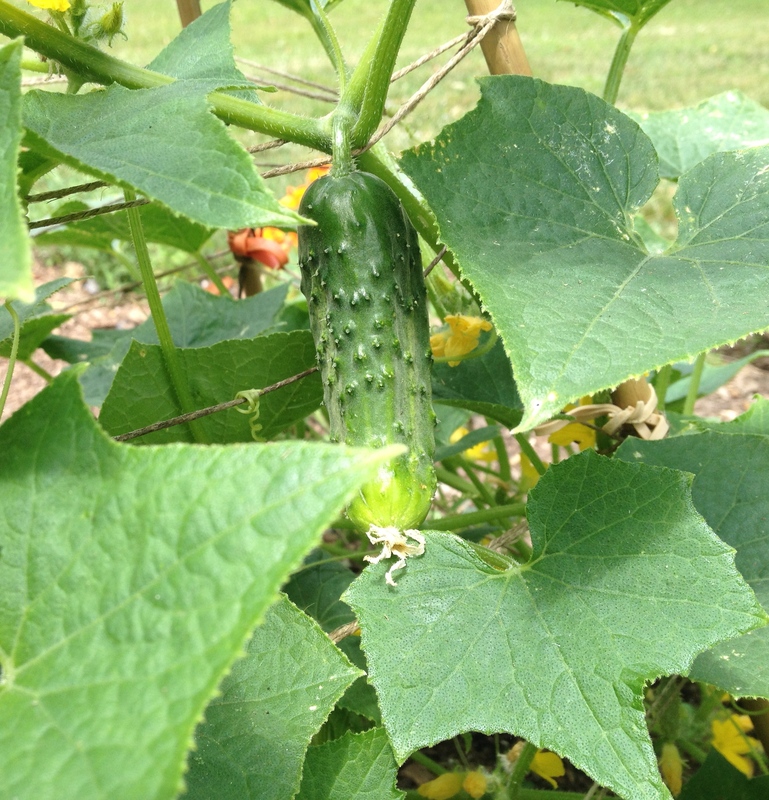 My Arkansas Little Leaf plants are suddenly festooned with adorable little cucumbers, some over three inches long. That’s still pretty tiny, but they are pickling cucumbers, and 100% of internet and print gardening wisdom warns against leaving your cucumbers on the vine too long (discoloration, bitterness and bad texture are the result). I desperately want to taste one my new cukes and don’t want them to get icky with age. But I also want them to grow to their full potential. Which is more mature: leaving them or picking them? Maybe I’ll wait ’til five inches. This tomato plant should be dead. 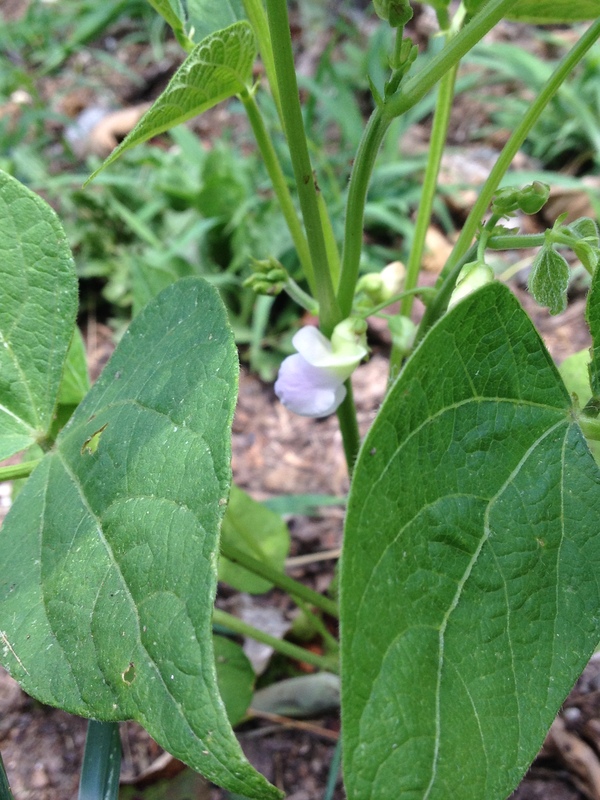 I got it as a seedling — a Cherokee Purple — and transplanted out in mid-April, way too early for central Virginia. When frost hit, I covered the plant as recommended but all the leaves died overnight anyway. I should have pulled it then, but at the time I had no other plants with which to replace it. So I left the lonely stem there. A few weeks later, new branches emerged. 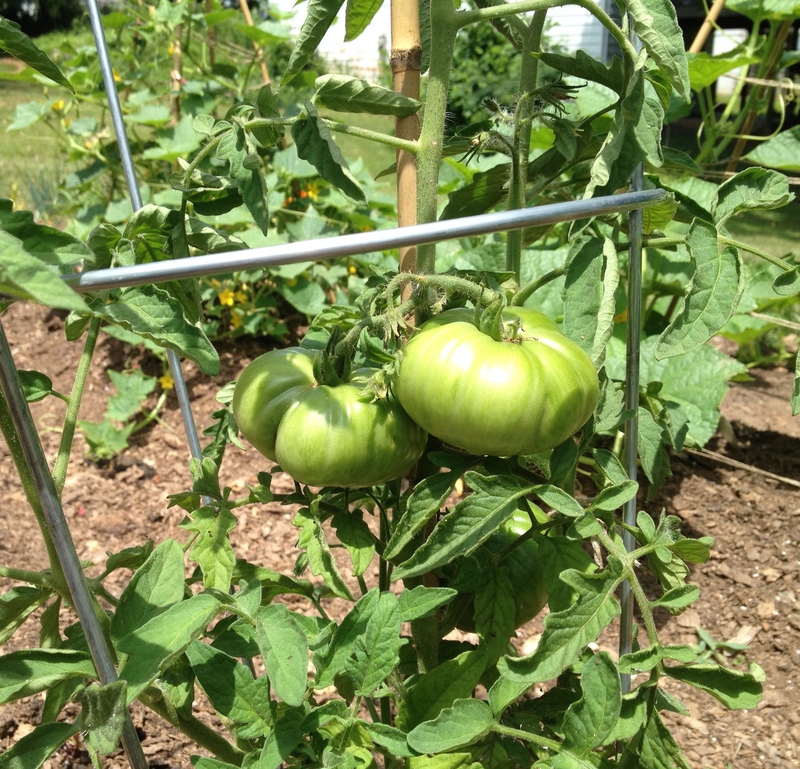 Now the plant is heavy with fat green tomatoes. We both got lucky: not every mistake is fatal. But! The plant would be farther ahead if it hadn’t been forced to regrow all its foliage. I could have been gloating over a stash of dusky heirloom fruits by now. I’ll know not to rush things next year. The biggest little squash, awaiting bees. The Canada Crookneck might be my favorite plant in the summer garden. It will — hopefully — produce large winter squash similar to butternut but sweeter, with a large curved neck, as the name suggests. The seeds come from Coggeshall Farm Museum, a Rhode Island operation that produces rare and heirloom seeds (I found a packet on sale at a historic house in Massachusetts). Most of the plants are still growing (quickly, dramatically!) and budding, but the tip of the vine pictured here was mysteriously broken off, maybe during a recent storm. Unable to grow outward, the vine responded by investing all its energy into one female blossom and its associated fruit, which is now the size of a finger — at least three times bigger than the fruits on other vines. People do this, too, sometimes by choice and sometimes by necessity. Writing projects are born as long “vines” that grow almost uncontrollably. At some point, you have to cut off that exploratory tendril and focus on the fruit, or you risk meandering unproductively.